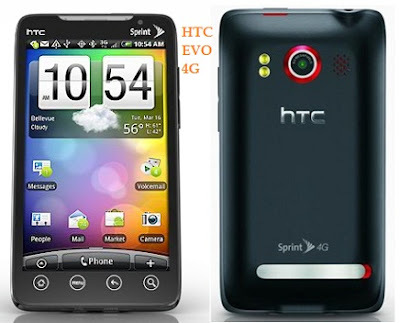 HTC EVO 4G is one of the most popular smartphones in United States. It is offered by Sprint carrier. HTC EVO 4G is a snazzy-looking Android touchscreen phone that houses a 1 GHz Qualcomm QSD 8650 processor for the smoothest mobile multi-tasking experience ever. On the large WVGA resolution capacitive multi-touch screen of this HTC smartphone, you can view clear, highly detailed visuals. Stunning entertainment is delivered to you in HD quality on the HTC smartphone. The 8-megapixel rear camera (with autofocus and 2x LED flash) of the HTC EVO 4G lets you capture detailed stills and video, while the 1.3-megapixel fixed focus front camera lets you video-conference with your contacts. Employing WiMax technology, this Android touchscreen phone allows you to access the Internet from up to five computers. Released for Sprint, the HTC Evo 4G is the world's first 4G Android handset, delivering download speeds up to 10 times faster than 3G -- making it possible to download music, photos, files, or videos in seconds. The handset features a 1GHz Qualcomm Snapdragon processor to ensure a smooth and quick user experience and comes with dual cameras, an 8.0-megapixel auto-focus camera with HD-capable video camcorder and a forward-facing 1.3-megapixel camera, so users can post high-quality video to YouTube and Facebook. The Web browser is optimized with Adobe Flash technology so video and animation are displayed the way they are meant to be seen. WiMax 4G technology delivers download speeds up to 10 times faster than 3G. Large 4.3-inch touch screen display delivers vivid and vibrant colors, sharp contrast, and true colors. Fast 1GHz Snapdragon processor for a responsive handset that multitasks from app to app without skipping any hesitation. Personalize the home screen with widgets that grab rich content from the lastest sports scores to current events and news. New People widget collects call, message, email and social networking updates from different circles of friends to easily keep in touch. Friend Stream lets users interaction with friends across Facebook, Twitter and Flickr by bringing updates, photos and shared links into a single easy to follow stream. New 'Leap' thumbnail view lets users jump to any one of seven panels on the home screen. Polite ringer automatically lowers the ringer volume when the phone is picked up. Wireless Band : CDMA 800 / 1900 / WiMax 2500. Size : 122 x 66 x 13 mm. Form Factor : Block . Display : 65,000 colors (480 x 800 px). Platform / OS : Google Android OS v2.1. GPS : Compass (Sprint Navigation / Google Maps). Bluetooth : 2.1 (A2DP / AVRCP / HFP / HSP / OPP / SPP). Browser : 2.0 (Webkit / Google Search). Navigation : Touch Screen (HTC Sense). Camera : 8.0 MP / Flash / Zoom / HD Video Recorder / 1.3 MP / Video Calling. Music: Sprint Music Store (MP3 / AAC / WMA / M4A / WAV). Email: POP3 / IMAP4 / SMTP / Gmail. Chat: AOL / Google / Windows Live / Yahoo. 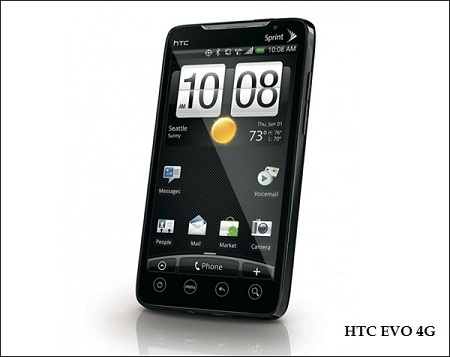 HTC EVO 4G - one of the most impressive phones ever made. The HTC EVO 4G is incredibly well-made and features a giant 4.3-inch capacitive TFT touchscreen, WiMAX connectivity, 8MP camera with 720p video capture and a kickstand on the back. Software-wise, it runs Android 2.1 with HTC's Sense UI on top. The interface performs smoothly and lets you use mail, social networks, calendars and so on with ease.